Led by Matthew Lazar, Founding Director and Conductor, and Beth Robin, Pianist/Accompanist, the chorus performs sacred and secular music in Hebrew, English, Yiddish and Ladino. 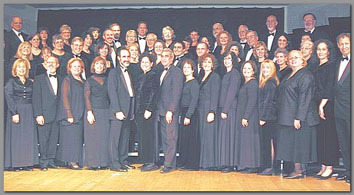 SHIRAH was formed in January, 1995 as a regional chorus specializing in the performance of the full spectrum of Jewish music. Its roster includes a multigenerational blend of amateur and professiional singers from the northern New Jersey/New York metropolitan area. SHIRAH performs regularly at the JCC on the Palisades and has been featured in many concerts in the United States and Israel, including Avery Fisher Hall, the New Jersey and Bergen Performing Arts Centers in Newark and Englewood and the Colden Center, featuring the World Premiere of “The Scroll” by Dov Selzer with the Queens Symphony. SHIRAH also performs annually at the North American Jewish Choral Festival and was featured in the Opening Ceremonies of the JCC Maccabi Games in East Rutherford at the Continental Airlines Arena. In addition, SHIRAH has given concerts for organizations and synagogues in the tri-state area and released its first CD in honor of their 10th anniversary. Founded with the generous support of its founding patrons, Bernard and Ruth Weinflash, the chours is sponsored by the JCC on the Palisades/Thurnauer School of Music. JCC Maccabi Games in East Rutherford at the Continental Airlines Arena.